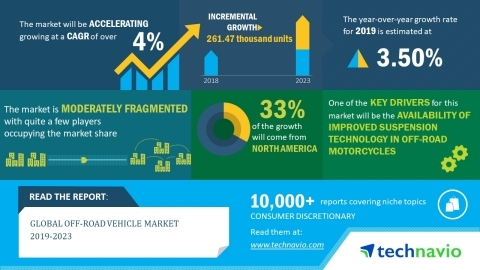 LONDON--(BUSINESS WIRE)--The global off-road vehicle market is expected to post a CAGR of over 4% during the period 2019-2023, according to the latest market research report by Technavio. Off-roading motorcycles need advanced suspension setup with dedicated shock absorbers to navigate through mud, gravel, rocky terrains, and rivers. To overcome such obstacles, adjustable rebound damping with hydraulic spring preload adjusters are being integrated into off-road motorcycles. Also, industry players have developed adjustable compression dampening that adjusts automatically with the speed of the motorcycle. Off-road motorcycles are also being fitted with adjustable rebound dampening that comes with hydraulic spring preload adjusters integrated into the system, making it more flexible in their setup and overall functioning. Such developments are creating the demand for off-road motorcycles, which in turn, is fueling off-road vehicle market growth. Per Technavio, the integration of electric drivetrains for off-road vehicles will have a positive impact on the market and contribute to its growth significantly over the forecast period. This global off-road vehicle market 2019-2023 research report also analyzes other important trends and market drivers that will affect market growth over 2019-2023. Various regulatory authorities across the globe are implementing strict norms to reduce GHG emission from vehicles. To comply with such regulations, vehicle manufacturers are shifting towards electric vehicles as they run on electricity powered by battery packs. This has encouraged ATV manufacturers to develop electric ATVs (e-ATVs) which ensures low emission and noise levels. “Industry players are developing hybrid ATVs which run on both electric power and fossil fuels, to reduce pollution. Also, manufacturers are focusing on sustainable designs which make e-ATVs capable of producing more power. The development of electric drivetrains for off-road vehicles will have a positive impact on the off-road vehicle market,” says an analyst at Technavio. This market research report segments the global off-road vehicle market by types (SxS, ATV, and off-road motorcycle) and geographical regions (APAC, Europe, MEA, North America, and South America). The SxS segment held the largest market share in 2018 owing to advantages such as rollover protection bars, multiple seating, storage facilities, high-power motor, and short travel suspension. Such features enable better handling and stability in difficult terrains. North America dominated the market in 2018. Various motorcycling and off-road rallying events, along with the increasing sale of ATV, SxS, dirt bikes, and adventure motorcycles are promoting market growth in this region, especially in the US and Canada.